It is hard to believe that it has been over three years since Dr. Anh Reiss, wife of Harris County Assistant District Attorney Josh Reiss, passed away from myelodysplastic syndrome, a form of leukemia. I first met Josh back in 2009 when there was a bone marrow registration drive at the CJC in the hopes of finding a suitable match for Anh. Although the registration drive signed up many new donors, a match was not found for her. Josh and I ended up becoming good friends and I kept up with Anh's condition as she and the Reiss family fought the disease for the next seven years. Unfortunately, she ultimately passed away on February 26th of 2016 after a truly long and courageous battle. Josh texted me yesterday to notify me of this editorial in the Houston Chronicle detailing Josh's efforts to have the anniversary of Anh's death officially memorialized Texas Bone Marrow, Blood, and Organ Donation Day in Texas. The bill in the legislature to create this day is sponsored by Democratic Representative (and HCDA Alum) Gene Wu. As noted in the editorial, it is also co-sponsored by a bipartisan list of area legislators. Obviously, this is an uncontroversial and fantastic idea. There are some very interesting statistics listed in the editorial regarding how many people favor the idea of donating organs and blood versus how many people are actually signed up to do so. You can learn more about the bone marrow registry by checking out bethematch.org. I'm proud to say that I signed up to be a blood marrow donor during a lunch break when I was a JP prosecutor way back in 1999. You should do it, too, if you haven't already. Good luck to Josh and the Reiss family on getting the Texas Bone Marrow, Blood and Organ Donation Day recognized, and thanks to Gene Wu for drafting the legislation to get it done. Local media is reporting some pretty shocking revelations this afternoon about the botched Houston Police Department raid that occurred on January 28th of this year. As you probably already know, that raid left five HPD officers wounded and two citizens, Dennis Tuttle and Rhogena Nicholas, dead. In the days following the raid, there were some early indications that there was more to the story than just a simple search warrant execution that had resulted in a gun battle. For starters, the affidavit supporting the issuance of the search warrant had been reliant on the word of a Confidential Informant (CI) who had allegedly told the police that he had purchased an amount of heroin from a male at 7815 Harding Street. The CI also allegedly told the police that the male at the residence had more heroin inside the house and that he had been in possession of a 9mm handgun. Officers used that little tidbit about the 9mm to ask the magistrate who signed the warrant to authorize them to do a "No Knock" warrant, meaning that they had the right to just kick the door to make entry. When executing search warrants, officers prefer using No Knock for two reasons: 1) officer safety, and 2) preventing the people inside the place to be searched from having time to destroy evidence. The alternative to a "No Knock" is a "Knock and Announce" warrant, which officers don't like. A police officer politely knocking on the door of a drug house and announcing he going to come inside is usually the cue for drug dealers to start flushing their product down the toilet. Unless a warrant articulates a particularized need (normally officer safety) to make entry without knocking, the presumption is that they must do a "knock and announce" before making entry. Usually, officers point out the danger to themselves by describing their belief that a person with a gun is inside the place to be searched. Since the vast majority of people who deal drugs out of locations are armed, it should not be surprising to know that "No Knock" warrants are quite common in narcotics search warrants. So, when the affidavit supporting a No Knock entry into 7815 Harding Street reported the individual inside the residence had a 9mm, that probably didn't seem to be too big of a stretch of the imagination to the magistrate signing the warrant. As far as warrants go, there was nothing facially out of the ordinary about the one in this case. But when the shootout was over and the smoke had cleared on January 28th, the reliability of the information in the search warrant came into question because there were two key things missing from the evidence recovered: a 9mm handgun or any trace of heroin. My initial reaction to this lack of evidence to support the CI's claims in the affidavit was that it must have been a lying CI. CIs, as a general rule, aren't the most reputable of people. In many cases, a CI has been charged with his or her own charges and are "working a contract" with narcotics officers. "Working a contract" means that they have a signed agreement with the D.A. 's Office and narcotics officers that they will provide information resulting in the arrests of other drug dealers. Those contracts are generally quantity based -- meaning that the CI will provide information that leads to the recovery of a set amount of drugs (like a kilo of cocaine, for instance). Because of that, CIs have a tremendous amount of motivation to exaggerate what they say to their narcotics officer "handlers." By necessity, CIs interact with suspects outside of direct supervision from their handlers. They typically don't wear bodycams or "wires" that could be discovered when they make purchases. They often go inside premises to make the purchases and their handlers lose a direct line of sight on them. To bolster the CI's credibility, officers search them for drugs before sending them inside to make a purchase. This assures that the CI isn't planting his or her own evidence. The officers also provide them with marked money to make the purchase, in the hopes that once an arrest is made, the target suspect will have that marked money in his or her possession. Other than those two minor safeguards, however, there is no real accountability in how an undercover drug purchase is described by a CI to an officer. There is no verification of whether or not a suspect is really seen with a gun. There is no verification of whether or not the CI really saw more drugs inside the premises. All an officer can attest to in an affidavit for an application for a search warrant is to attest that the CI has provided good and reliable information in the past. So, when there was no heroin and no 9mm recovered on Harding Street, I figured that HPD narcotics had been taken for a ride by a dishonest snitch. In this post, I predicted that an investigation into the botched raid would lead to some embarrassment for HPD, but probably nothing criminal. Today's revelations may have me eating my words about that. Houston Police Chief Art Acevedo today announced that the "confidential informant" utilized by HPD Narcotics in this particular raid didn't actually exist. According to the Houston Chronicle, Officer Gerald Goines (who was severely wounded in the raid) provided investigators with the name of the CI who had provided him with the information that he used to get a search warrant. In the subsequent investigation, that CI denied having ever gone to the Harding Street location or buying drugs there. Additional interviews with other CIs utilized by Goines found that they had no knowledge of drug activity on the property, either. More disturbing, according to the Chronicle article is that another one of the narcotics officers, Steven Bryant, had admitted to investigative officers that the heroin allegedly provided to him and Goines by the (apparently fictional) CI was actually heroin that he had gotten from Goines' vehicle. So, to summarize, a married couple (and their dog) were shot to death by Houston Police Officers who entered into their house with a search warrant that was obtained on the word of a non-existent snitch and planted heroin that came directly from the officer who wrote the warrant. This is absolutely stunning to me. 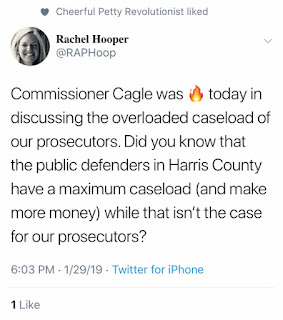 In my twenty years of being involved in the Harris County Criminal Justice world, I've seen some dumb mistakes, but this level of corruption is like something out of a movie. It looks like Joe Gamaldi was a little premature in using this incident to give his "putting dirtbags on notice" speech. The outlook for Goines and Bryant is pretty grim. If it is proven that they intentionally lied in an affidavit for a search warrant, that would be a felony. If a felony leads to a death, there's an argument to be made that they committed a couple of felony murders. The bigger concern for all agencies who participate in undercover drug buys is that this incident calls into question all undercover buys leading to search warrants. If a Confidential Informant's reliability was cause for concern, the possibility of rogue officers fabricating CIs and planting evidence is devastating. The bottom line is that all search warrants are signed off on based on an officer's credibility as he or she relates the facts to a magistrate. There is nothing more required to verify the veracity of the information contained in the supporting affidavits. It is a fairly common practice in drug cases for defense attorneys to file a Motion to Reveal the Confidential Informant. Those confidential informants are usually protected from being identified unless otherwise ordered by a judge. In my experience, those motions are rarely granted. My suspicion is that in the aftermath of the Harding Street raid, more and more of these Motions are going to be filed, and Judges are going to feel additional pressure to Order those CIs to be revealed. If that becomes the norm, you are going to find less and less people willing to work as CIs -- regardless of the legal benefit to them. of information before the signing of warrants, but finding a way to have that verification and not compromise an investigation will be no easy task. Today's announcement from Chief Acevedo is just the beginning of the fallout that will come from the events of January 28th. Police officers, prosecutors, defense attorneys, and judges can expect a lot of changes to the way these things are done in the future. Unfortunately, those changes will be coming too late for Dennis Tuttle, Rhogena Nicholas, and the officers injured in the raid on Harding Street. Since I'm a firm believer in the premise that you shouldn't make fun of others unless you are willing to make fun of yourself, I will share the following awkward memento. This is an awkward screen grab from an even more awkward video from my 1998 Criminal Trial Advocacy class at UH. In this exercise, I'm trying (and failing) to learn how to admit a photograph into evidence. My sponsoring witness is David Cunningham. The pained looking judge on the bench is George Murphy. 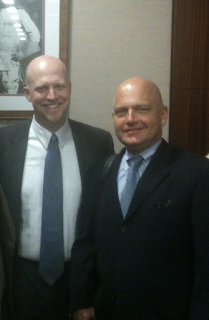 I think I would rather pass a kidney stone than watch how bad I was back then, but I have to give major kudos to Dave, George and (not pictured) Judge Belinda Hill. This was really a wonderful class that gave some very real and very practical advice to aspiring trial lawyers. 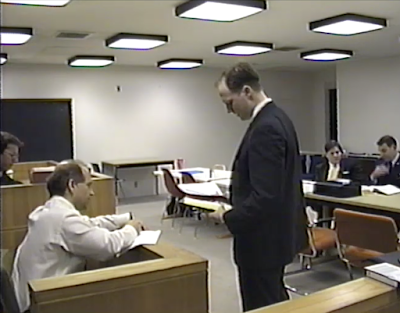 It's been 21 years since this picture was taken and I'm honored to be able to say I've gone on to practice alongside (and in Judge Hill's case, in front of) these great lawyers. I'm also glad that I apparently got over the nervous habit of slapping my hands to my sides while talking as if I were some sort of spastic penguin. I just wish someone had told me and Dave to go ahead and shave our heads back then. Despart noted that attorney Audia Jones has filed a Notice of Treasurer in the 2020 race for District Attorney. 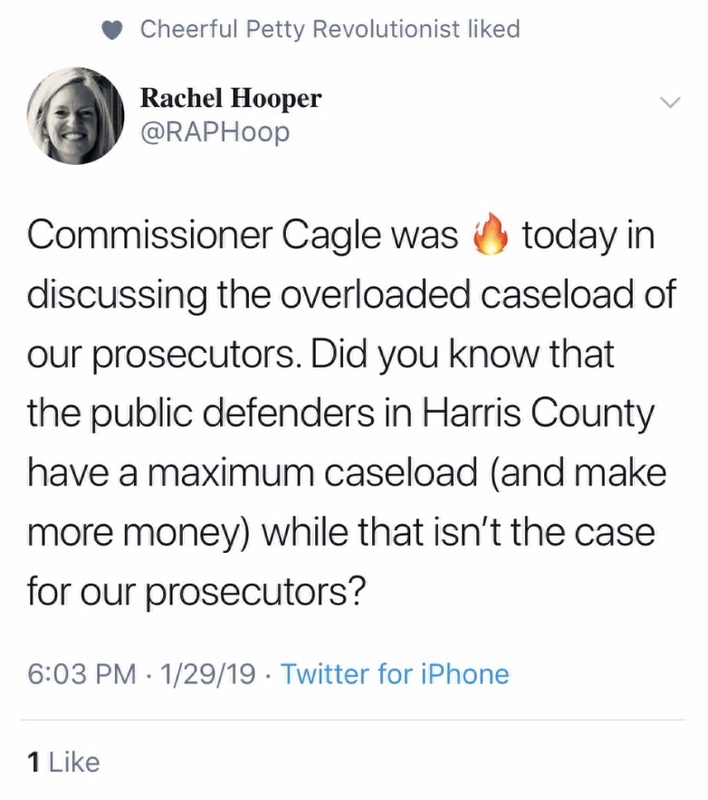 Jones, who recently left the Harris County District Attorney's Office, has been very vocal on her Facebook page about her vision for the Criminal Justice System. Her posts have also been critical of the D.A. 's Office's current administration. Jones is married to 180th District Court Judge DaSean Jones, who just took office on January 1st of this year. 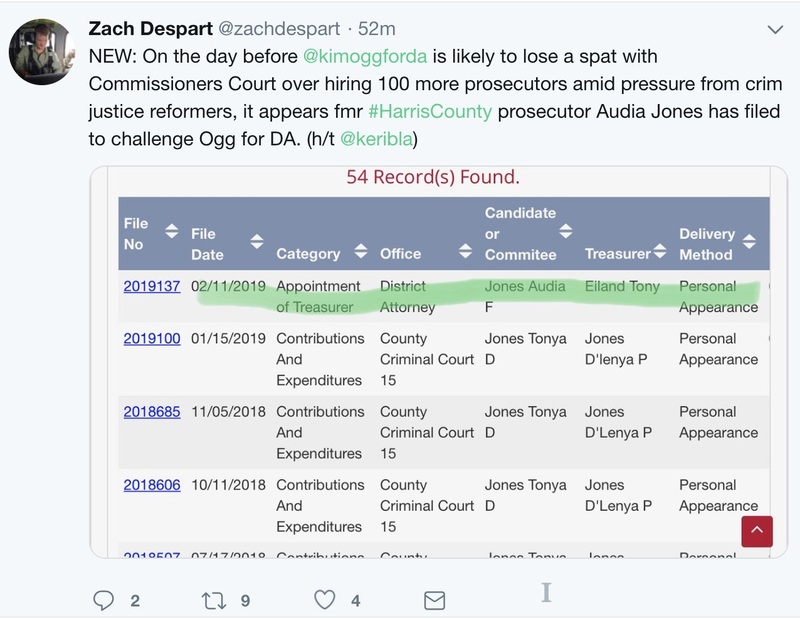 In the event that Jones were to win the race for District Attorney, there would probably be some question as to whether or not her husband could preside over cases prosecuted by the District Attorney's Office. In all honesty, I'm not sure what the answer to that question would be. Rachel is sounding like somebody who is getting ready to make a run. She's been in the Civil World for some time now, but who knows? Maybe she misses the excitement of the Criminal Justice System. 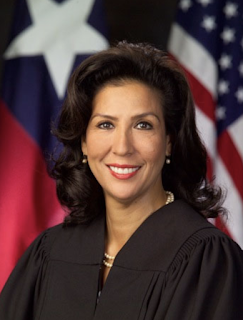 Quite frankly, I think that any candidate running for Harris County D.A. as a Republican in 2020 is just throwing his or her money in the toilet. After the bashing that Republicans took in 2018, that's going to be a fool's errand if Trump is still at the top of the ballot in 2020. Although straight-ticket voting is (fortunately) now a thing of the past in Texas, I don't know if the change will be enough to make up those margins. I expect that the "protest turnout" of voters who show up just to vote against Trump will remain extremely high and that doesn't bode well for any candidate running as an R in 2020. On the plus side, I think that most smart candidates know this. I'm expecting a pretty quiet Republican Primary. Hopefully, it will be so quiet that no one will feel all that compelled to "buy ads" from sleazy Slate producers like Terry Lowry and Steven Hotze. I think that if anyone has a chance to win as a Republican candidate for District Attorney in 2020, it would need to be someone that would appeal to Latino and Latina voters. The Republican Party has been rather alienating to those voters in the Trump Era and if the Republicans were smart, they would start trying to build some bridges to that community instead of burning them. A charismatic, qualified, and experienced Latina candidate would be ideal in that situation, and if I were leading the Harris County Republican Party, I would be working overtime to recruit someone that matched that description. But where could they ever find a candidate like that? Stay tuned, folks. 2020 is already getting interesting. The Harris County Criminal Justice World was shocked and saddened today by the unexpected and untimely passing of recently-elected Judge Cassandra Hollemon. Judge Hollemon held the bench of County Court at Law # 12 after winning election this past November. I wish that I could offer some personal insight into Judge Hollemon's passing, but sadly, she passed away before I ever had the opportunity to appear before her. In the 20 years since I've been practicing law, I've never known of a Harris County Judge who passed while in Office. I believe that the last Harris County Judge to die in office was 230th District Court Judge Joe Kegans in 1997. It is a significant and sad event. Although I didn't know Judge Hollemon, I am sorry that we did not get a chance to know her and see what she would have accomplished on the bench. My sincerest condolences go out to her family and friends.